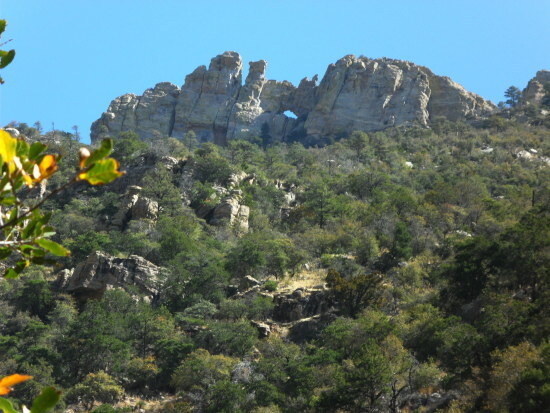 Getting to the Window in the Santa Catalinas is a challenge, mostly because of the 4000 foot elevation gain. In the past two years Diane and I have made three previous attempts, all of which were aborted because we simply either ran out of time or energy. Today, we left very early in the morning, and because we are right now in very good shape, made it with little trouble, completing the entire hike in just under eleven hours. Some pictures below the fold. 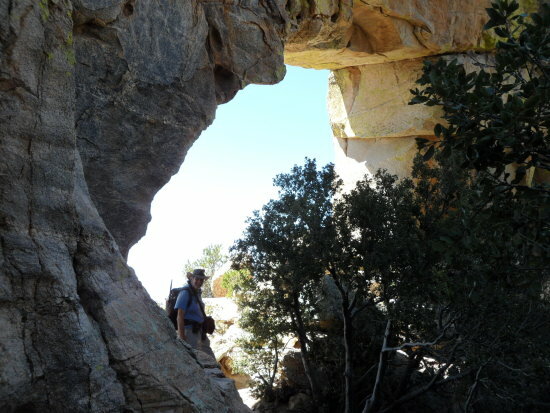 This first glimpse of the Window is seen after you have hiked more than 4 miles and gained about 2,200 feet elevation. At this moment we still had about 2.6 miles and 1,800 feet of elevation to climb. 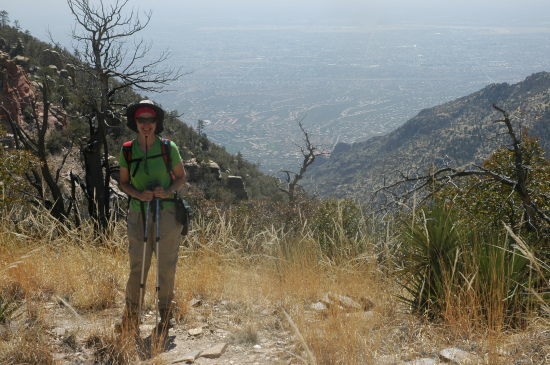 I took this picture of Diane when we were still about 400 feet below the Window, on a wide ridge that not only looked out to the south at Tucson but if I turned around I would look north toward Phoenix. From here the views were breath-taking. Yours truly under the Window. 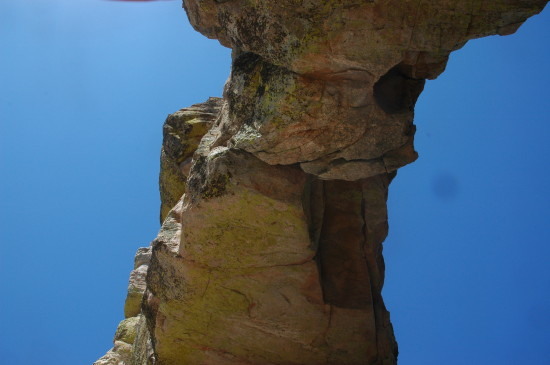 While there, I laid on my back and took this picture looking up at the arch, about thirty feet above my head. Quite impressive. Hikes like this energize me, even if I feel totally wiped out for a day or two afterward. By challenging yourself to do things that few people attempt, you get to see things that most people never see. On this particular day only one other person made the hike to the Window. From what we could gather on our way up as well upon our return, almost everyone else limited their hike to the first three miles of the trail. They saw some pretty spectacular scenery, but missed the best parts for sure. Thanks for the pictures from your hike. I’ve hiked around Death Valley and seen some arches, but nothing like that. What’s with the haze over Tucson? Looks like a fun hike.